Posted on January 19, 2017 by Sabrina C.
It was a book that had been on my reading list since it came out. However, I only just got around to reading it and couldn’t believe the adventure I’d missed. Lu tells an amazingly detailed story about a government soldier tracking down the most wanted criminal in the Republic. You can imagine what happens as the novice, June, and poor robber, Day, cross paths during her hunt. She falls for him on the street, unaware of his true identity, her target. She has to decide if avenging her brother’s death is more important than staying with this stranger she’s grown to love. Lu’s writing intrigues me because she focuses on small details that lead to the end of the story which most readers would find insignificant. This engages the reader to pay attention to the words they’re reading. I loved it so much, I just had to get the second book. Like Legend, this book has remained on my list but I didn’t put it on priority. So when I found it at the Mission Viejo Library’s bookstore, I knew it was finally my time to discover the story. Hundreds of years into the future, this spinoff of the Cinderella takes place in a New Beijing in a world where androids are normal to help people with daily chores and sometimes cyborgs roam among the crowd. However, it isn’t easy when you’re not considered human and work as lowly mechanic. Especially when your stepmother and stepsister want nothing to do with you to begin with. When the letumosis disease, plaguing the city issues a cyborg draft, Cinder’s stepmother doesn’t miss her chance to sign up her daughter for an experiment no one comes back from. Not long after Cinder’s admission, the doctor finds there is much more to her than just a few missing parts. Meyer tells this dystopian story while still adding elements of the original fairytale, just like the rest of the books in her series. I’ve done a review on this novel already, but I couldn’t help from mentioning it as it was a very memorable read for me. It was very different from most horror stories and took the word “nightmare” to a whole new level. Of course, this book ended with a cliffhanger and many unanswered questions, so I was ecstatic to find there was a sequel. A high schooler, Liz, tells the story from her point of view behind a camera lens, a perspective of the world as she sees it. Her life takes an unexpected turn when her best friend, Kate, decides to shut her out without warning or reason, and everyone whispers rumors and accusations behind her back. Suddenly, her world is out of focus and she tries to make sense of it all while still holding onto her friendship. This realistic story is told through a series of poems, which makes the events even more enticing and easy to follow along. I had to finish this book in one sitting because I couldn’t tear my eyes away from the pages without reading what came next. I would definitely read this book again. Posted on July 21, 2014 by Erika T.
Cinder by Marissa Meyer is a great summer read! 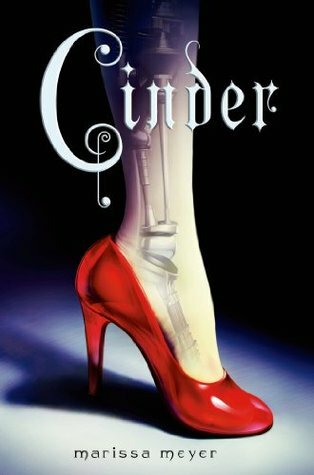 With a fusion of the classic fairy tale, Cinderella, and the futuristic story of Star Wars, Cinder had me on the edge of my seat the entire time! This sci-fi story takes place in the far future. In the future Earth has been through two more World Wars, been unified as a peaceful place, and is neighbors to the powerful alien race, Lunars, who live on the moon. Earth leaders have been trying to negotiate a peace treaty with Lunars. The protagonist of the story is, Cinder, a teenage cyborg girl who is looked down upon by society and by her stepmother. When Cinder meets the charming Prince Kai, she finds her world slowly turning upside down. At the same time, her family is being attacked by the incurable plague. Devastated from the aftermath of the plague, Cinder’s stepmother volunteers Cinder to the cyborg draft. The cyborg draft has cyborgs test cures for the plague and no cyborg has come out alive. At the medical facilities, Cinder unravels the hidden truths about her life. These truths put herself, Prince Kai, and the entire Earth in danger. Cinder is soon intertwined with the outcome of every being on Earth and Luna! Check out this book this summer to live through the adventure of Cinder! I would recommend this book to every teen! Cinder is an amazing new twist to the fairy tale we all know and love. There is action, romance, and suspense! It is filled with so many new surprises! There is that one big question that haunted me and I didn’t know the answer until the very end of the book. I couldn’t help but constantly wonder what was going to happen next! Because of that I couldn’t stop reading it! If you liked Divergent or The Hunger Games I recommend this book for you!